What a group of great kids I have the honor of working with every day. We were getting ready to head back outside to play and stopped to take a Valentine picture. 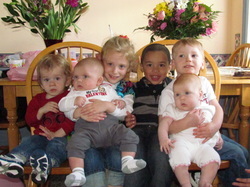 Zane, Addison, Barrett (on Addison's lap) Remington, Jonathan and Julia (on Jonathan's lap, although she isn't here until August she comes with mom to pick up Jonathan).